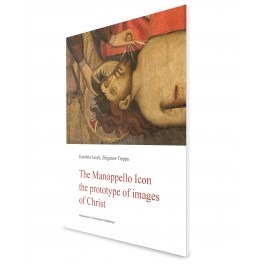 There is a new academic publication on the Manoppello Image, available in both polish and english version as Ikona z Manoppello prototypem wizerunków Chrystusa and The Manoppello Icon. The prototype of images of Christ. There is a table of contents ("spis treści") available for download. The authors are Karolina Aszyk, an art specialist, and Zbigniew Treppa, professional photographer as well as theologian and lecturer at the University of Gdańsk, which released this work. The price of it is 36.75 PLN, roughly 10 $ without a shipping fee. Having familiarized with a polish version, I can say a few words about it. It is an interesting study of visual properties of the Veil when photographed during different lighting conditions,as well as of the influence of the Veil on Byzantine, medieval, and renaissance art. Yet I think that the arguments presented are not strong enough to convince declared sceptic, and further researches in those directions (including those I try to perform myself) is necessary. Comment: I don’t think there’s any solid pieces of evidence for the presence of that vail before the 16th Century in Italy… In that context, how can someone publish a serious study of the influence of that relic on Byzantine art? All this will always remains pure speculation. On the contrary, we know for a fact that the Mandylion was in Edessa since at least the middle of the 6th Century and came to Constantinople with great attention in 944. Clearly, author Falcinelli was of the opinion that Manoppello was the Veronica lost from Rome and apparently uplifted by the mysterious stranger who gave it to Giacomo Leonelli in 1506. Yes, of course. But the matter is not that simple. While I agree that the mandylion brought to the Constantinople in 944 was the Shroud (of Turin), but the history of the Mandylion seems to be more complex than standard Wilson theory. I ask: what was the original King Abgar’s Mandylion? What it is reported to be: most certainly an image of the face of the living Christ with big wide open eyes and no bruises or bloodstains on it. So what Image fits this description? I suggest you suspend judgment until you have an opportunity to read paper on Markwardt’s Saint Louis conference presentation. He is now of the view that Mandylion & Shroud were two different objects, but Scavone seems still to reserve the view they were the same. Markwardt’s paper due out about Christmas. Markwardt still holds the view that Bishop Avercius used the Shroud as visual aid for conversion of Abgar VIII court, reflected in Bardesanic Hymn of Pearl, then returned it to Antioch, event recorded as allegory relating to Abgar V, because of Emperor Severus. With impending destruction of Antioch, it was sent to Cappadocia, subsequently at some time to Constantinople. I recommand O.K. and you Daveb to also take notice of the paper presented in St Louis by Sébastien Cataldo (for which I’ve made a lot of researches and contributions). In it, we show quite clearly how the evolution of the Abgar legend was determined by the proclaiming of Christian dogmas (such as the one of the two natures of Christ) and the numerous battles done by the Orthodox Church of Edessa (not always done honestly, I should add) against various heretical groups of Christians that were present in that region of the Middle East… Understanding this important historical context is crucial to understand the appearance of the Image of Edessa in the Abgar legend (first as a painted portrait done by the archivist of the king) and its succesive transformations (most probably done to confort the orthodox views of the Edessa Church against these heretical groups). Markwardt’s contention that the Shroud was used in the conversion of court of Abgar VIII was not derived from the Abgar legend, but from the epitaph inscription of Bishop Avercius (or Abercius), particularly in relation to being accompanied by a fish of large size which a holy virgin drew from a fountain, which Markwardt asserts is a reference to the Shroud image using the language of disciplina arcana, also by the contemporary Bardesanic Hymn of the Pearl. He sees the origin of the Abgar legend as the archival record of the conversion set in allegorical terms to the predecessor Abgar V because of the anti-christian policies of the new emperor Severus, and the already precarious position of Abgar VIII in the imperial court because of his previous pro-Parthian policy. Whether or not theological implications of the heretical groups is included in the legend is a side issue. Markwardt does not subscribe to the Wilson Mandylion = Shroud hypothesis. I suggest a reading of the Markwardt 2008 Ohio paper makes it clear enough. The Saint Louis paper expected by Christmas will expand on this further. [edited by moderator] In the historical context of the time (not in the imagination of someone like Markwardt), the war of the Edessa Church against the heretics and its will to stay “orthodox” in face of the new dogmas proclaimed by the official councils done by the Church of these days are most probably THE MAIN REASONS for why the Edessa Church invented the Image of Edessa and included it Inside the Abgar legend! But of course, you’re free to believe otherwise. Daveb is quite correct. Nobody invented anything, the disciplina arcana, things stated in couched language, was part of the show, the times dictated that kind of approach. What about what was written in the book “The Face of God”, by Paul Badde. He seems to make a very good case for the Manoppello image. “The Face of God” is a must read in the topic of Manoppello. Although written in reportage convention, and more heart-moving tale, than mere concise factual report (and slightly exaggerating at times) it nevertheless needs to be read, as it contains a lot of information. But they cannot be taken uncritically.